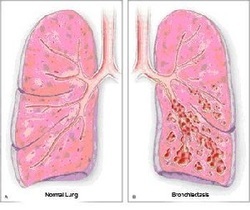 Bronchiectasis is associated with cystic fibrosis and obstruction of the bronchial by mucous, foreign bodies and tumor as well as lung infection. Kartagener syndrome may present with collection of symptoms and signs which include situs inversus ( dextrocardia), sterility, bronchiectasis and recurrent cases of sinusitis. Pathologically, the airway especially in the lower lobe is dilated with inflammation and fibrosis of the bronchial wall.The dilated airway is identified with CT scan with an additional of signet ring appearance. The treatment of bronchiectasis may include bronchodilators and antibiotic as well as treatment of the underlying causes.